With spunbond, the filaments or fibres are spun as in a normal spinning process with melt or a solution. This takes place with thermoplastic raw materials directly in the spunmelt process. A polymer granulate is molten and fed into a spinning jet. The emerging thread or filament is then either aerodynamically or mechanically drawn out and thus stretched. The filaments are laid out in circular rows whereby even, multi-directional properties are achieved. This is, in the strictest sense, the melt spunbond material. If the still liquid filaments are torn in a hot air flow, fine single strands are produced in the so-called meltblown process. 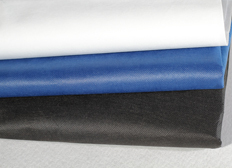 This process variation results in a microfiber web which is then laid onto a cooling belt. Frequently several layers are produced or the web is produced with the material web directly as a laminate. Thermoelastomers as well as thermoplasts can be processed in this way. The combination of various successive treatments such as embossing and thermobonding results in a nonwoven with the lowest basis weight and rigidity. At this point it is worth mentioning the electrostatic spunbonding process. Here, molten fibres are sprayed into an electrostatic field. Contrary to melt spunbond, the solution spinning process still exists, in which almost all polymers, as with normal chemical fibre processes, can be treated. The most well-known of these is the high-pressure evaporation or flashspun process, which results in a fine, fibrous nonwoven.